Tarzan Slot: The character of Tarzan was brought to life in 1912 by Edgar Rice Burroughs, and has since inspired countless stories and films. Over a century after his creation, Tarzan is now the star of a Microgaming online slot, which offers you an unforgettable jungle adventure with stacked wilds, free spins, expanding wilds, rolling reels, multipliers, and a Pick-a-Potamus Bonus. 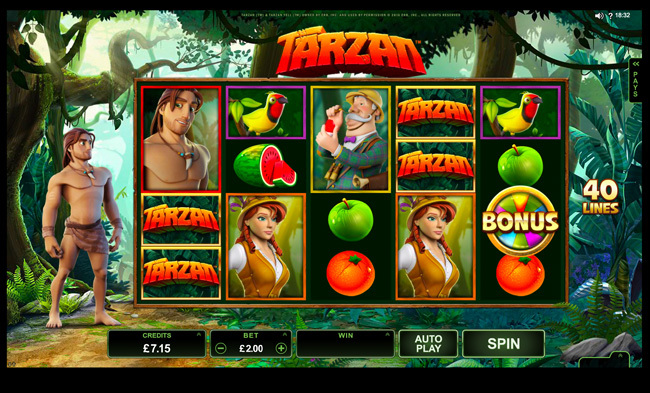 Tarzan is a five-reel slot with forty fixed paylines that you can play with as little as 40p and up to £40 per spin. It also has a wonderfully high RTP (Return to Player Rate) of 96.48%. At the bottom of the game screen, you can see how many credits you currently have left to play with. You can also alter the size of your bet, see your most recent win amount, set up auto-play, and spin the reels. The slot contains some great jungle imagery, but it’s our hero that your eyes are constantly drawn to thanks to the excellent animations provided by the game’s creator. Tarzan stands expectantly at the left-hand side of the reels, occasionally blowing hair out of his eyes, scratching his back, eating fruit, and crossing his arms. The paytable symbols are crystal clear and colourful, and they include a cute parrot, Jane, plums, apples, oranges, watermelons, Jane’s father, a monkey, a cheetah, the game logo, and a bonus wheel. The Tarzan logo is the wild, and it appears stacked to give you more chances to win. It can also replace all symbols except the scatter. The Bonus Wheel acts as the scatter in the Tarzan online slot, and when it lands in three separate locations on the same spin, it triggers the main bonus feature which can result in three exciting outcomes – free spins, the Pick-a-Potamus Bonus where you can win instant cash prizes, or a jackpot of up to 1,000 times your total bet. The Free Spins Bonus gives you twelve free games where the stacked wild symbol grows with each spin, and it’s also possible to land back-to-back wins with the Rolling Reels Feature. Rolling Reels (which you may have already experienced in other Microgaming slots such as Immortal Romance) remove all symbols used in winning combinations and allow new ones to take their place. Therefore, if a new win occurs once the reels have ‘tumbled’, the Tumbling Reels feature will keep being activated until no more wins are possible. The Pick-a-Potamus Bonus lets you win cash rewards by picking up to twelve hippos until you uncover the ‘POP!’ symbol. The jackpot prize can range from 200 times to 1,000 times your bet depending on how many Bonus Wheel scatters triggered the bonus feature.